I wasn’t a big fish eater until my mid-20s. My mom always cooked dinner but hated fish, so it was never on our menu when I was a kid. As I got older, I started to sample friends’ fish dishes when we were out to eat and occasionally bought a piece of fish to cook at home. I quickly became a fan. While I’ve fallen in love with all sorts of fish over the years, one thing my pantry is never without is canned salmon. Why? Well it’s a super-convenient source of protein, and has four times the amount of heart-healthy omega-3s as a serving of canned tuna. Those omega-3s may help save your skin when it comes to sun exposure too. Find out how much you need to eat here. While it might be confusing to figure out what the most sustainable catches are at the fish counter, when you’re in the canned-fish aisle at your grocery store you’ll quickly notice that most brands of canned salmon are labeled “wild Alaskan,” which makes it easy to buy sustainable fish. (Click here to learn more about what to look for on the label when you buy canned salmon.) Here are some of my favorite salmon recipes, along with a few tips. Enjoy! 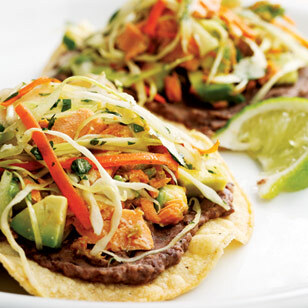 Black Bean & Salmon Tostadas —Pickled jalapeños, cilantro and avocado perk up convenient canned salmon for a quick tostada topping. Skip store-bought and make your own crispy shells in the oven. Salmon Salad Sandwich—Salmon salad served on tangy pumpernickel bread makes an easy dinner—a double batch will give you lunch the next day. Salmon & Roasted Vegetable Salad—Toss roasted vegetables and salmon with a flavor-packed vinaigrette to serve on top of greens for a hearty dinner salad. For a twist, add a poached or fried egg on top. Salmon Rösti—Convenient frozen hash browns and flaked salmon come together for a twist on this traditional Swiss favorite. We love the creamy dill sauce, but a dollop of ketchup is tasty too.